Dufu Technology, a manufacturer of HDD components, is a gem waiting to be unleashed as this counter remains very underpriced and largely gone unnoticed by the market, despite its massive surge in earnings by riding on the recovery in global demand for HDD and more importantly its expansion into China. It is operating in a 120K sq ft factory in Bayan Lepas Free Trade Zone, Penang, producing mainly HDD components such as disk clamps, disk spacers, hexagon nuts etc which contributed about 80% of its revenue. The company also manufactures components for industrial safety and sensor, telecommunication, computer peripheral and computer electronics. Its main customers are Western Digital, Seagate and Hitachi Global Storage Technology, which are some of the largest HDD manufacturers in the world. It is understood that Dufu commands a market share of 20-30% of the disk spacers and disk clamps globally while its closest competitors are Disk Precision Industries, Global Primax of China and Notion Vtec. Ok. The main story is that it has acquired a Chinese company named Futron Technology Limited in 1Q2009 which is complementary to the company's business as Futron also manufactures and trades components of HDD and computer peripherals. About 70% of its revenue comes from South East Asia while the remaining is from China. Its factory is located near Guangzhou and has a size of 90K sq ft which allows Dufu further expansion. The beauty of the acquisition was that Dufu acquired it at a very cheap price of RM20mil which is about PE '09 of 4x. 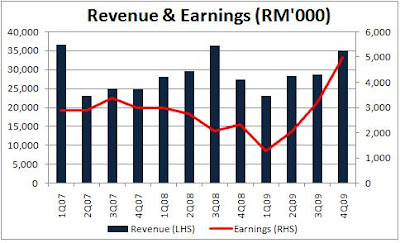 As at 9 months ending Sept 2008, its revenue was about RM20mil with net profit of RM2.5mil. This was about 1/3 of Dufu's earnings. In addition, the acquisition also came with a profit guarantee of RM5 mil for 2009 where any shortfall from the profit guarantee will be compensated. Currently, utilization rate of its factories is about 90% in Penang and 100% in China. It has planned RM20mil for expansion in 2010 of which about half of it will be used by 1Q2010. With the acquisition of Futron coupled with the recovering market, Dufu's earnings and margins have been expanding significantly and even breached its historical peak. Its latest net profit and net margin reached RM5 mil and 14.2% respectively in 4Q09, surpassing its height of RM3.4mil and 13.5% respectively back in 3Q07.